← May the 4th Be With You – Star Wars M&M’s Packs! M&M’s Dulce de Leche Caramel! By the late 1990’s and early 2000’s, marketers had become well aware of the importance of the growing Hispanic population in the United States. One of the ways the confectionery business began flirting with this market was by incorporating traditionally Hispanic flavors into their products. I previously covered the Mango with Chili Fun Dip flavor that Wonka developed but never produced. 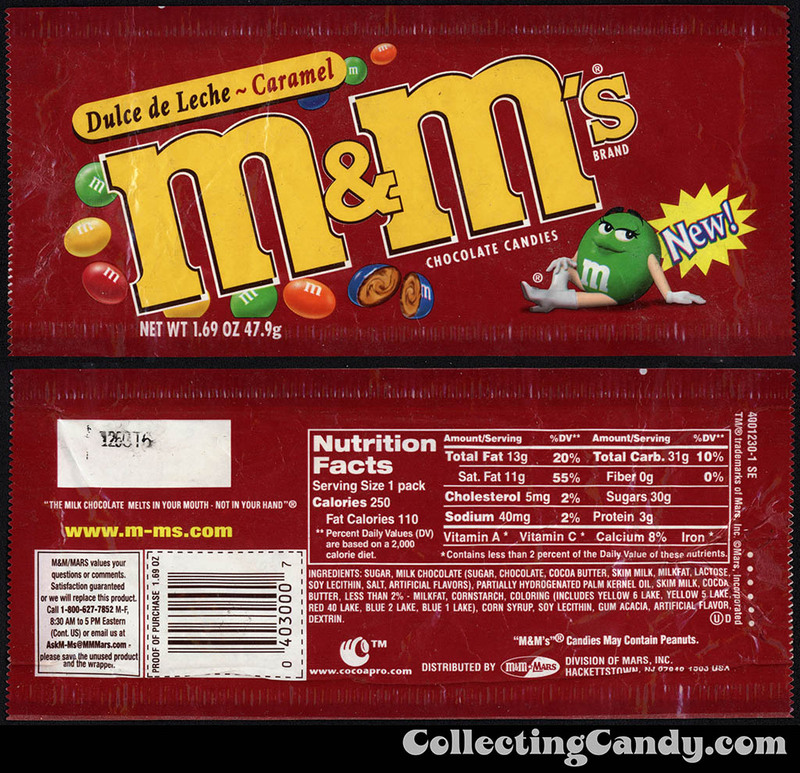 Today I’m excited to feature an M&M’s product released in 2002 which embraced a traditionally Mexican and South American treat flavor – Dulce de Leche Caramel M&M’s! Unlike some of the limited edition flavors released over the last decade, Dulce de Leche Caramel appears intended to have become part of the standard assortment of M&M’s flavors. I don’t think I ever noticed these when they were out but the flavor sounds so good, it’s one I wish I had the chance to sample. M&M’s Dulce de Leche ended up having a fairly short run in stores and one that may have only ever been available in select regions, but I’d like to think that the flavor could one day make a return. Anyone remember trying these when they were out? I’d love to hear what you thought of them. And that’s everything I’ve got on M&M’s Dulce de Leche Caramel. See you next time! This entry was posted in Chocolate, M&M's, Mars and tagged 2000's, candy collecting, candy collection, candy collector, candy wrapper collection, candy wrapper collector, chocolate, collectible, collecting candy, confectionery, confections, Dulce de Leche, flavors, Hispanic, M&M's, Mars, Mexican, packaging, sweets, vintage candy wrapper, wrapper. Bookmark the permalink. 24 Responses to M&M’s Dulce de Leche Caramel! I only had them a few times. I was extremely disappointed when they disappeared from stores. I thought I had them in Houston, but it may have been San Antonio. I was just randomly telling my husband about them and went online to see if they might still exist out of the US. But it looks like they were a very short run. I would love to see them back. We had them on our honeymoon in Newport Beach CA. We bought them at Long’ s. I loved them and went back and bought all they had. They were not chewy but truly dulce de leche. I wish they’d bring them back. I loved these so much I wrote to M&Ms about them. I received a response that they were merely test marketing them in select regions (I purchased mine in Southern California). I’m not sure why they never made it out of the test marketingn phase, they were amazing, and I wish they’d come back! I came across the dulce de leche m&m’s at the shoppette on Ramstein AB in Germany when my husband was stationed there with the USAF in 2002. They only had the big bags at the store and I bought 2. Omg, loved, loved, loved them so much. I must confess I’m not a fan of m&m’s but I’m a huge caramel fan, so I couldn’t help but buy them. The next time I went back to the store they had sold out and they never got another shipment. I never got to taste them again 🙁 For now I live in hope that they will be released again. I had these one year while on vacation in Orlando! So good! I was using any excuse to head back to Publix to buy more! Everyone who tasted them loved them so I was so sure they would be available nationwide but sadly, it was not to be. The lady that ran a store near our house in Victoria,tx use to gave us her box of samples she had gotten from the company. They were my favorite. I bought them in Boca Raton FL back in 2001-2002. I was living in Boca Raton but travelling back and forth to Omaha NE every 2 months and would bring 5 or 6 bags of Dulce du Leche to NE with me each time. They were amazing!! I heard they were just test marketing them in areas with Spanish population. Wish they would bring them back. They were delicious!!! I remember these only found one small package. When I contacted the company was told it was only in test markets. Sooo good. I had them on my honeymoon in 2002. We bought them in Puerto Rico and they were amazing! I just saw that they are going to be releasing caramel m&m’s soon. It’s ridiculous how excited I am about that! Yeah, I’m pretty excited about the new M&M’s Caramel coming soon, too! A very different product than these, as the new ones are actually caramel-filled. But still awesome! My husband and I found these on a cruise ship in 2001. They were so delicious!! We couldn’t wait until they started selling in the stores, but sadly they never did! I’m so disappointed that the new caramel ones they are going to come out with look nothing like the dulce de leche ones! The dulce de leche m&m’s were NOT chewy! I’ve checked the internet for these a few times over the years. I had them in Los Angeles back in 2001 and they were so popular I never thought they’d go away. They were the best candy on the market. Wish they’d bring them back. I was fascinated with the announcement of them, and my sister-in-law in Los Angeles got a case of them for me, which I tasted and enjoyed very much, then sealed the rest and have saved in my cupboard ever since. I’d forgotten about them until now. I figured they’d be a good investment, since Pepsi-cola’s Josta soft drink skyrocketed in value after it was discontinued. Wow, you still have those? There is a new auction posted for a 14oz big bag, new and unopened, on ebay! OMG! I love love loved me sum dulce de leche M&ms! I would die if they brought em back! That would be awesome, but at least we have the newly-released M&M’s Caramel. They’re pretty fantastic! I did not like the caramel M&Ms. I think they made a bad move with the firmer chewy caramel. Should’ve been like caramello filling. I like the new M&M’s Caramel, though I’m sure a more free-flowing caramel would be tasty. I have to wonder if it’s even possible to have a more liquidy center for an M&M. Based on what I’ve read, even the firmer caramel center presented all manner of technological problems that they needed to overcome to bring the product to market. 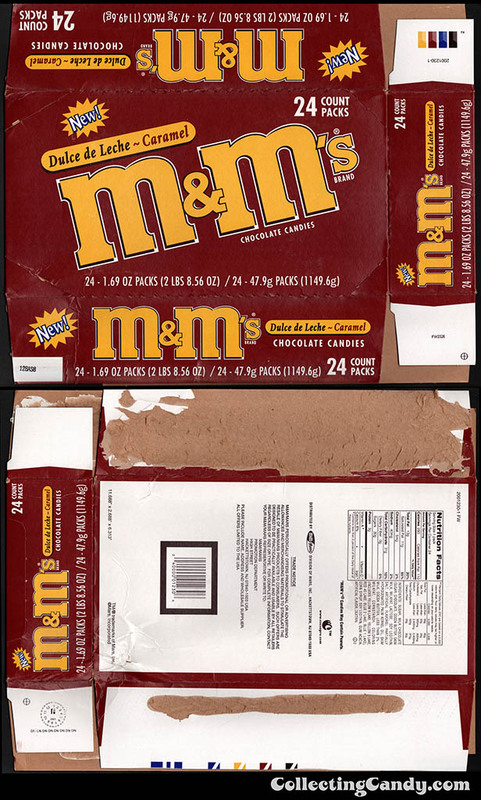 Not only that, I’d imagine that the packs would just get squished (leaving them full of liquidy caramel), as the candy coating isn’t what holds an M&M’s shape, it’s the firm core. So, a wonderful idea, but probably not possible with regard to the M&M format. 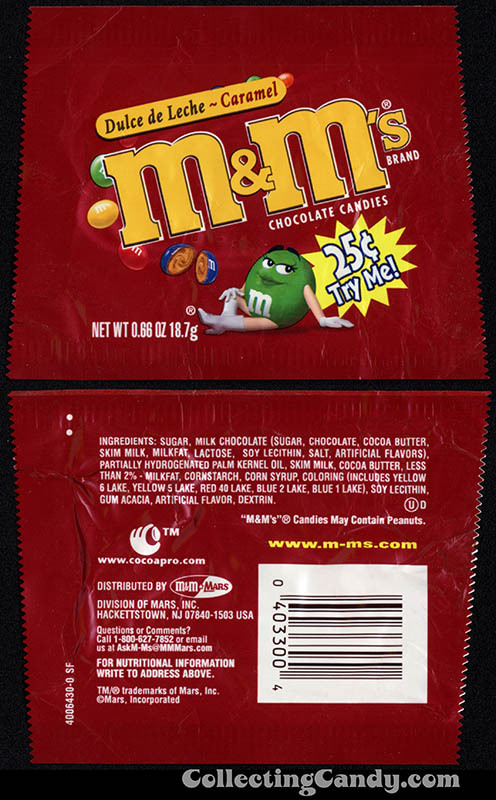 I had these at the M&M store in Las Vegas, I think even before they were released to the public (I was with my mother, who got Alzheimer’s starting in 2000 and never went back to LV again). They were delicious, and I looked eagerly for them in Colorado after I got home, but they never made it here. The next time I was at the store, some years later, they were totally gone. Sigh.